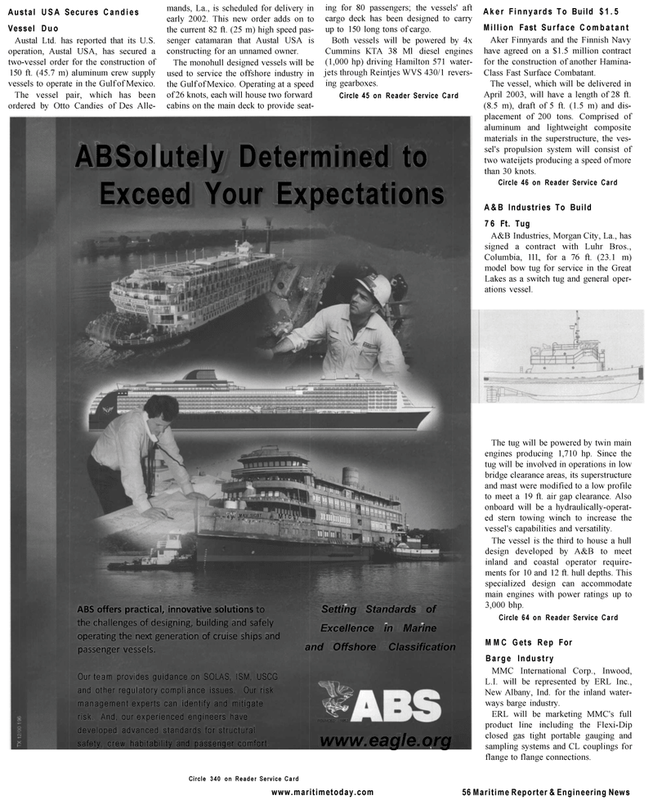 ABS offers practical, innovative solutions to the challenges of designing, building and safely operating the next generation of cruise ships and passenger vessels. Austal Ltd. has reported that its U.S. operation, Austal USA, has secured a two-vessel order for the construction of 150 ft. (45.7 m) aluminum crew supply vessels to operate in the Gulf of Mexico. The vessel pair, which has been ordered by Otto Candies of Des Alle- mands, La., is scheduled for delivery in early 2002. This new order adds on to the current 82 ft. (25 m) high speed pas- senger catamaran that Austal USA is constructing for an unnamed owner. The tug will be powered by twin main engines producing 1,710 hp. Since the tug will be involved in operations in low bridge clearance areas, its superstructure and mast were modified to a low profile to meet a 19 ft. air gap clearance. Also onboard will be a hydraulically-operat- ed stern towing winch to increase the vessel's capabilities and versatility. The vessel is the third to house a hull design developed by A&B to meet inland and coastal operator require- ments for 10 and 12 ft. hull depths. This specialized design can accommodate main engines with power ratings up to 3,000 bhp. New Albany, Ind. for the inland water- ways barge industry. Lakes as a switch tug and general oper- ations vessel. ing for 80 passengers; the vessels' aft cargo deck has been designed to carry up to 150 long tons of cargo. Cummins KTA 38 Ml diesel engines (1,000 hp) driving Hamilton 571 water- jets through Reintjes WVS 430/1 revers- ing gearboxes. April 2003, will have a length of 28 ft. (8.5 m), draft of 5 ft. (1.5 m) and dis- placement of 200 tons. Comprised of aluminum and lightweight composite materials in the superstructure, the ves- sel's propulsion system will consist of two wateijets producing a speed of more than 30 knots.